MossyMade: Happy Fawny Holiday Week! This week Lawn Fawn is having a Very Fawny Holiday week sharing holiday creations to inspire you for the upcoming season. Today I am sharing this card as well as a video which you can see on the Lawn Fawn Blog or on the Lawn Fawn YouTube channel HERE. I was inspired by Jennifer McGuire who recently posted THIS card on her blog, I loved the colors she used for the sky and wanted to do a version of my very own. 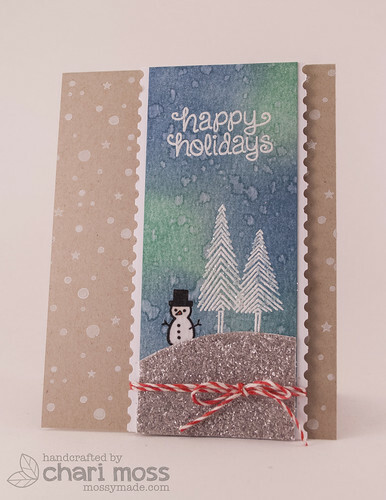 I also used this card as an opportunity to try out the distress glitter that has been sitting on my desk for over a month and love the sparkly silver snow it created. Be sure to visit the Lawn Fawn blog for the video as well as other holiday creations! I love the background you created and that snowman is too cute! Great card!